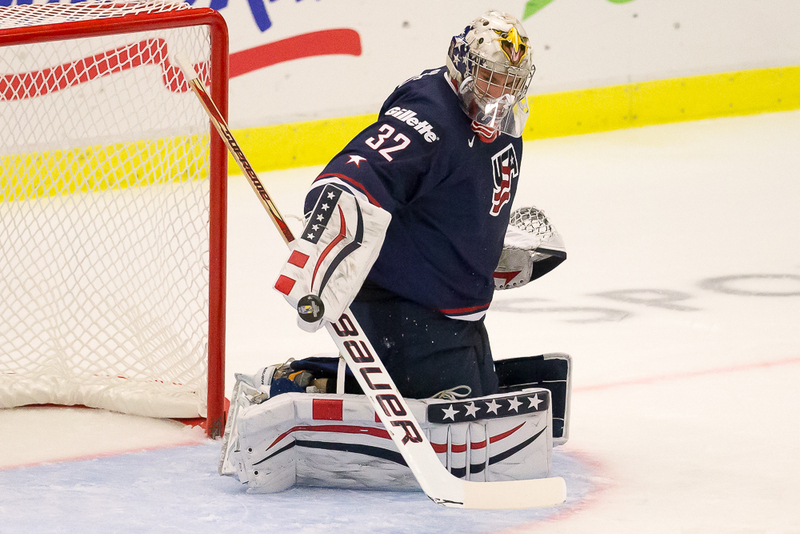 In their quarterfinal matchup of the 2014 World Juniors, the United States faced off against Russia this morning. Coming in, the United States had won six of their last seven quarterfinal matchups, but had also never beaten Russia in a playoff game, going 0-4. Something had to give. The result was a frustrating 5-3 loss that eliminated the Americans from the tournament. The loss is particularly frustrating because the tournament had began with so much promise for the Americans. They dominated in their first three games, winning by a combined score of 19-4 over the Czech Republic, Slovakia, and Germany. The power play was clicking at a blistering rate, scoring on 11 of 17 opportunities for a conversion rate of 64.7%, by far the best in the tournament. But within just a three day span, everything unraveled for the Americans, starting with their game against Canada. When they lost to Canada, the Americans drew by far the toughest route to gold. More than likely, they would have to defeat Russia, then Sweden in the semifinals, and then one of Canada or Finland in the finals. In the World Juniors, there is no such thing as a guaranteed win, but the way things were looking, their opponents would be a gauntlet. It is true that if you want to win the gold, you are going to have to beat the best teams. But usually, you don’t have to beat all three of them in a span of four days. In their two losses that ended their tournament, there were three prevailing themes that prevented them from advancing. In their first three games, the power play was what made the US offense go. Of the nineteen goals they scored in the first three games, eleven were on the power play. That included six power play goals against Germany. The US was effectively utilizing their pointmen, specifically Matt Grzelcyk and Will Butcher, who got shots to the net and worked the power play from the blueline. Butcher and Grzelcyk combined for 10 points in those first three games. The puck movement was phenomenal, and creativity was evident. Heading into the game against Canada, the USA must have been licking their chops. The Canadians were the most penalized team in the tournament. The Canadians were able to stay fairly disciplined throughout the game, taking only three minor penalties, none of which the US was able to capitalize on. In the game against Russia, the US had a number of opportunities to score on the power play, but again, could not capitalize. They struggled to even get set up in the Russian zone, looking like a group of five individuals on the ice instead of a cohesive unit. Their repeated individual rushes into the zone were stymied by the Russians, and they never really threatened the Russians on the power play. They lacked the chemistry that made them so successful in the beginning of the tournament, finishing the tournament 0-11. It is important to note that the Canadians and Russians were by far the toughest opponents the US faced, so it would be unreasonable to expect their power play to continue to click at an absurd rate. But, having zero combined power play goals against those two teams is not a recipe for success. In the beginning of the tournament, the penalty kill had not been as lights out as the power play. They killed 9 of 12 opportunities, and in the final two games, they killed 8 of 11. It is not that the penalty kill got significantly worse, but the US took too many penalties. In the second and third periods of the games, when the US was trying to either take the lead or mount a comeback, they took a combined ten minors. These penalties killed the US’s momentum, forcing them to play shorthanded when they needed to be pressing for offense. Against the Russians, the US surrendered two five on three goals in the second period, both blasts from the point by Nikita Zadorov. Those goals proved to be the difference in the elimination game. Riley Barber on officiating: "We know that coming in that it's a tough referee tournament & we should've been more prepared for it"
US captain Riley Barber admitted that they had to be more disciplined, but it was too little, too late. A few of the penalties were particularly frustrating because they could have simply been avoided by effort, and moving your feet instead of reaching. In both games, the US held a lead at one point for a decent period of time. They led Canada 1-0 in the second period for around 9 minutes, and had two leads over Russia for around 22 minutes. In both cases, the US’s lead did not last because the team got away from playing their game. When their opponent pushed back and put pressure on them, instead of responding in kind, the US more or less folded. They stopped using their speed, and allowed their opponent to dictate the play. This was the major reason for the significant number of minor penalties taken, the US stopped moving their feet despite being the fastest team in the tournament. In the face of adversity, they did not respond. One reason for this is that it was their first time facing it the entire tournament after walking over their first three opponents. Canada faced plenty of adversity in their loss to the Czech Republic, so when they were down, they dug their heels in and fought back. Despite having their tournament lives on the line, the US never really tested the Russians in the third period. Andrei Vasilevski gave up 3 goals early, looking as shaky as he ever has in his three World Junior tournaments. But, once the US was down, there was no furious response or push to score. The pressure simply wasn’t there. Jon Gillies finished the tournament with a .892 save percentage. Norway’s Joachim Svendsen currently has a .926 save percentage, playing behind a far inferior lineup. Simply put, Gillies was very average. He never appeared to be completely comfortable in net the entire tournament. When John Gibson was in net for the US last year and a shot was coming toward him, you were very confident he would save it. You could not say the same for Gillies. It would be unreasonable to expect him to repeat Gibson’s performance, one of the greatest in recent memory, but he needed to be better. His rebound control was erratic throughout the tournament, especially in the final two games. Most of the time he’d make the first save, but left a number of juicy rebounds right in the slot. You can’t blame him for everything; the team took too many penalties and did not clear the porch well. But, Gillies didn’t make any of the difficult saves to bail his team out or to swing momentum. The combination of these three factors led to the US’s early departure from the 2014 World Juniors. In the end, they lacked the response needed when facing adversity, and stopped doing the things that made them successful early on.